In 2014, St Clair Superior Development Corporation (SCSDC) in Cleveland OH will unleash the eighth in its series of annual public art campaigns celebrating the Lunar Chinese Year. 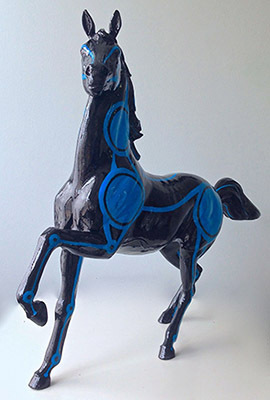 This year’s project commemorates the Chinese Year of the Horse, which begins with the new moon January 31, 2014. The June 2014 installation will showcase Cleveland’s AsiaTown community as well as St. Clair Superior’s blossoming arts district and thriving business community. Through a variety of education programs and other events throughout the year, the Year of the Horse Project promotes investment in the St. Clair Superior neighborhood, celebrates city-wide cultural awareness and supports arts education and the local artist community. As a computer artist, I really enjoy the movie Tron. I aimed to translate the beauty of the computer graphics style on to this horse. Inspired by the famous Light Cycle scene, I attempted to create a Light Horse.